For more than three decades, Tommy Lasorda has been the face of the Los Angeles Dodgers. And after more than sixty years in the Dodgers’ organization, Tommy Lasorda remains the embodiment of Dodger Blue. 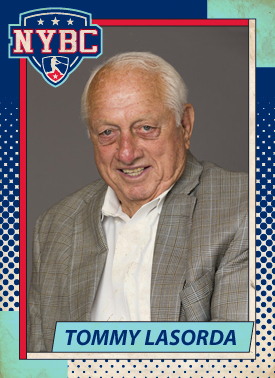 Lasorda, who managed the Los Angeles Dodgers from 1976-1996, was inducted into the National Baseball Hall of Fame in 1997 by the Veterans Committee following a career where he won 1,599 games, two World Series and two more National League pennants – all with the Dodgers. Thomas Charles Lasorda was born Sept. 22, 1927 in Norristown, Pa. He got his start in pro baseball at the age of 18 as a southpaw pitcher when he signed with the Phillies in 1945 before serving two years in the military. In 1948, Lasorda made a record-making return to the baseball scene with the Schenectady Blue Jays as he authored a 25-strikeout performance. In 1949, the Dodgers drafted him from the Phillies, and he made a new home pitching for the Greenville Spinners and the Montreal Royals. During his time with the Royals, Lasorda led his team to four minor league championships. Lasorda made his Major League debut on Aug. 5, 1954 with the Dodgers. He played for the Dodgers for two seasons before being traded to the Kansas City Athletics, where he pitched for one season. After the 1960 season, Lasorda ended his playing career in pro ball and became a scout for the Dodgers until 1965. He managed in the minor leagues from 1966-72, and in 1973 Tommy made his way back to the big leagues as a third base coach for the L.A. Dodgers under another future Hall of Fame manager – Walter Alston. Alston retired in 1976 after 23 years with the Dodgers, and Lasorda took the reins. By 1978, he had led the Dodgers to two straight National League championships, and became the first NL manager to win pennants in their first two seasons. After losing to the Yankees in both the 1977 and 1978 World Series, the Dodgers went on to win the World Series over the Yankees in 1981. They defeated the A’s in 1988 to give Lasorda his second World Series title. After retiring in 1996, Lasorda stayed busy working in baseball. In 2000, he managed the U.S. Olympic Baseball Team to a gold medal in the Sydney Games. Robert J. Valentine is a former Major League Baseball player and manager. He is currently athletic director of Sacred Heart University in Fairfield, Conn., as well as an analyst for SportsNet New York. Valentine retired after a year as manager of the Boston Red Sox in 2012. Prior to that, from 2009 to 2011, he was an ESPN baseball analyst. Valentine also managed the Chiba Lotte Marines in the Japanese Pacific League (1995, 2004-2009), the New York Mets (1996-2002) and the Texas Rangers (1985 to 1992). He also played for five teams during his 10-year playing career in the Majors: the Los Angeles Dodgers, California Angels, San Diego Padres, New York Mets and Seattle Mariners. Valentine is also the owner of a chain of restaurants and co-founded the Shin Taku Juko School in Japan. In 2010, Valentine started the production company, Makuhari Media, with producing partner Andrew J. Muscato. The company produces sports-themed documentaries. Recent productions include Schooled: The Price of College Sports, Branca’s Pitch and Ballplayer: Pelotero. 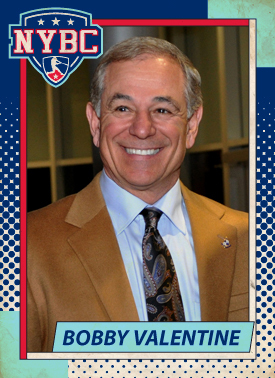 He is the owner of the Bobby Valentine Sports Academy and helped to found the Mickey Lione, Jr., Scholarship Fund, which awards scholarships to Stamford sophomores who excel off the field and exemplify the values that Lione instilled in his athletes and students. In 2015, Valentine was awarded the Major League Baseball Players Alumni Association Lifetime Achievement Award for his on-field accomplishments and off-field contributions to communities across the nation. A legend in baseball, current Washington Nationals manager Dusty Baker is the only three-time Major League Baseball Manager of the Year in history, a former All-Star as a player, and a former Marine. Dusty is a bilingual speaker (English & Spanish) who talks frequently on leadership, teamwork, motivation, and success. In addition to leading the Reds to two NL Central titles and three playoff appearances in six years, Baker previously led the San Francisco Giants and Chicago Cubs, winning the 2002 National League pennant with the Giants. Drafted by the Atlanta Braves in the 1967 amateur draft out of Del Campo High School near Sacramento, CA, Baker began his professional baseball career as an outfielder for the Braves in 1968. After spending 16 full seasons with the Atlanta Braves, Los Angeles Dodgers, as well as a short tenure with the San Francisco Giants and Oakland Athletics, Baker finished his prosperous career as a player with a .278 batting average, 242 home runs, and 1,013 RBI. Baker’s coaching career started with his former Dodger arch-rival: the San Francisco Giants. Baker began as a first base coach in 1988, and then spent the following four years (1989-1992) as the hitting coach before taking over as manager in 1993. In his very first year as Giants manager, he won the NL Manager of the Year award, leading the team to a 103-59 record, which was the second-best record in baseball that year (behind the 104-58 Atlanta Braves). His Giants went on to win division titles in 1997 and again in 2000 after which Baker was honored as Manager of the Year for both years. In 2002, the Giants earned the Wild Card and advanced to the World Series where they lost in seven games to the Anaheim Angels. In 2003, Baker left the Giants to join the Chicago Cubs, where he made a major impact in his first season as manager. With the help of an impressive pitching staff and big gun batters such as Sammy Sosa and Moisés Alou, the Chicago Cubs were able to claim their first divisional title in over a decade. In 2004, the team was involved in a heated Wild Card chase with the Houston Astros but fell out of contention near the season’s end. In the subsequent season, the Cubs lost several of their key players, most notably ace pitchers Mark Prior and Kerry Wood, to injuries. The team finished the season with a 79-83 record, marking the first time in three years that the Cubs finished with a losing record. Baker left the Cubs following their 2006 season and subsequently went on to become an analyst for ESPN. After two seasons away from professional baseball, Baker was named the Washington Nationals manager on Nov. 5, 2015. He will lead a talented roster, including Bryce Harper and Max Scherzer, to what the nation’s capital hopes is a World Series title. Baker’s hobbies include hunting and fishing, and he is fluent in Spanish. 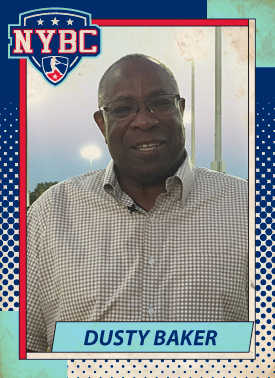 He founded the Dusty Baker International Academy of Baseball in Sacramento and is supportive of many local charitable organizations.